SmallHD 1303 HDR Gold Mount Kit Enjoy daylight visibility and all its favorite accessories with this Gold Mount kit. 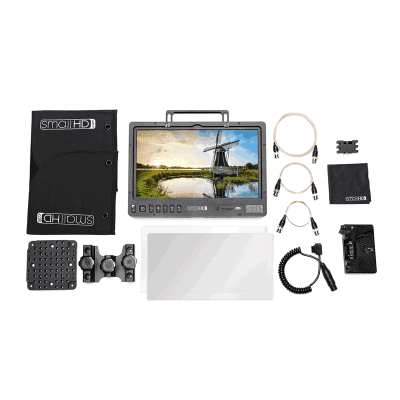 SmallHD 1303 HDR Gold Mount Kit display size, resolution, and pixel density of the 1303 production monitor make it an invaluable tool for precision focus pulling. When you don’t have the time or proper measurements, a razor-sharp, low latency display will help you hit your marks. Preview what you’re sending downstream using the Output Preview Page, while utilizing software features like customizable focus assist and peaking on your 1303 monitor. If it’s the only monitor near by, its color accuracy (100% REC 709) and broad viewing angle make it easy to share with clients and directors. SmallHD 1303 HDR Gold Mount Kit With a panel roughly 3x brighter than most production monitors, the 1303 is not restrained by ambient light. Its optically bonded LCD combats glare and sunlight, allowing you to pull focus in less than ideal shooting environments. All SmallHD® production monitors are equipped with the Rapid Rail Mounting System; the simplest way to connect, store, and travel with critical monitor accessories. Transitioning from table to C-Stand happens safely and securely with the 1303’s VESA compatible mounting accessory.